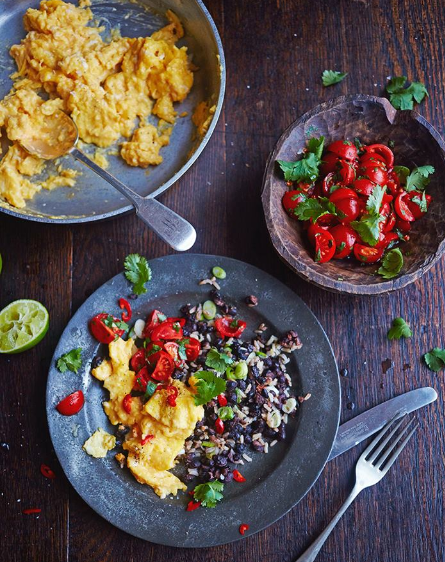 World-renowned Jamie Oliver, of "The Naked Chef" (BBC cooking series) shares his spin on the Costa Rican traditional breakfast dish of Gallo Pinto or painted rooster. Olivier adds details, such as the brown rice rather than the conventional white used by Costa Rican housewives for the morning meal, to add a healthier slant to the meal. The British chef is famous for his campaigns to improve food quality and nutrition in schools and supermarket shelves. He also suggests serving the rice and beans combo with a salad known as chimichurri: finely chopped tomatoes, onions and sweet peppers with cilantro, seasoning and lemon juice. Although not a typical accompaniment to breakfast, this popular salad is a very healthy addition to this meal that is usually served with sour cream or cheese, and fried ripe plantain. Like the majority of traditional Costa Rican cooking, this dish has the advantage of being gluten-free and vegetarian. Of course, no Tico would dream of preparing the morning pinto with tinned beans, but nobody’s perfect! What do you like to eat with your gallo pinto? We like ours with slices of avocado and a generously helping of sour cream, washed down with a cup of freshly brewed Costa Rican coffee. Cook the rice according to the packet instructions. Once al dente, remove from the heat, drain and rinse under cold water, then set aside. Peel and finely chop the garlic, then drain the beans. Place a large frying pan over a medium heat, add the cumin seeds and toast for 1 minute. Add 1 tablespoon of oil, the garlic and ground coriander, and fry for 1 minute, then stir in the drained beans. Fry for 5 minutes, or until the beans start to crisp, stirring occasionally. Roughly chop the tomatoes, then pick and finely chop the fresh coriander and mix together to make a salsa. Squeeze in the juice of 1 lime and season well. Stir the rice into the beans and fry for a further 5 minutes, or until piping hot, then finely slice and stir through the spring onions. Whisk the eggs, season, then cook in a non-stick pan over a low-medium heat, until scrambled and creamy. Serve the rice topped with scrambled eggs and a spoonful of tomato salsa, with the remaining lime, cut in half, on the side for squeezing over.